Ancient Wonders are special types of buildings that provide unique and powerful benefits for our cities. We first unlock Ancient Wonders in chapter II and we unlock more of them as we progress throughout the game. This overview will tell you everything you need to know about Ancient Wonders and how they work. For detailed facts about each wonder, see Ancient Wonder Details or the Ancient Wonders Comparison Guide. Each individual Ancient Wonder provides unique benefits for your city. The one thing that is true about all of them, however, is they provide their benefit in a more efficient way for the space they take up than will be possible by any other type of building in the game that provides that same type of benefit. Especially as are upgraded to higher and higher levels, they become extremely powerful. 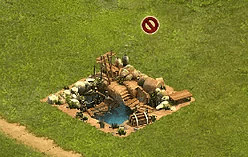 In order to be able to build these special buildings, there are certain requirements that must be met: Research, Rune Circle, other Resources, and Road Connection. Unlock the research for the first Ancient Wonders during chapter II. Each new chapter offers new Ancient Wonder research. Each research completed opens up two new Ancient Wonders. Before the wonder can be built, the Rune circle will need to have all nine Runes activated. Fill the Rune Circle by inserting Rune Shards. 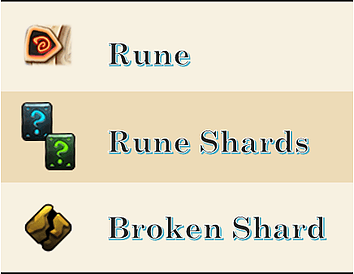 Each inserted Rune Shard activates a Rune or breaks into a Broken Shard, enough of which can also activate Runes. 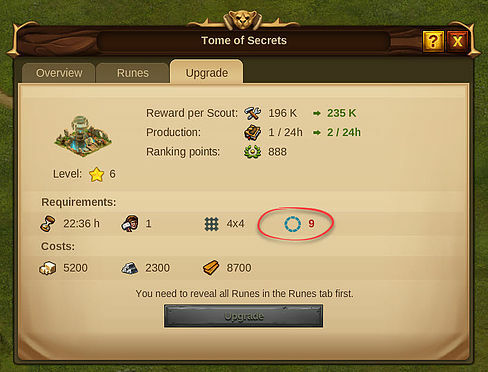 More about Runes and Rune Shards will be explained in a later section, but for now, know that the Rune Circle must be filled in order to build any wonder. Building each Ancient Wonder will require some basic goods. The goods required will vary for each wonder. It doesn’t show in the build requirements, but all Ancient Wonders do require a road connection. Hover over the Ancient Wonders icon to see the Rune Shard inventory. 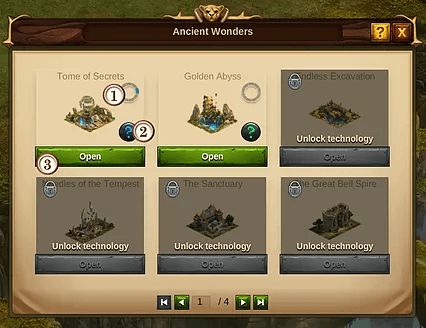 Click the Ancient Wonders icon to access the menu. See how many more Runes need to be filled before this wonder can be built. Blue indicates filled. 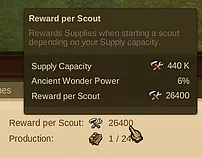 Indicates unused Rune Shards are available for this wonder. Click to access the menu for any unlocked Ancient Wonder. Hover over any locked Ancient Wonder for a preview of its benefits and requirements. When you click to open an Ancient Wonder, you’ll be taken to a new window with three tabs. The overview tab shows the benefits of the current level. It also shows how many Rune Shards are in inventory. The Runes tab is where you can insert Rune Shards to fill the Rune Circle. The Build tab shows you any remaining build requirements, and allows you to place the wonder once each are met. Hover over each benefit to see additional details about what it is and how it is determined. Nine Runes fill a Rune Circle. When all nine runes are filled, the Ancient Wonder may be built. 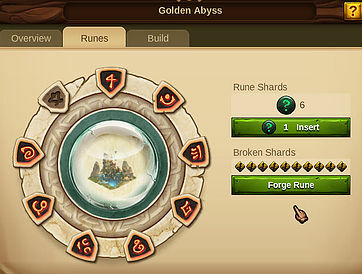 Rune Shards are required to activate Runes to fill the Rune Circle. Each Ancient Wonder has its own unique Rune Shard. 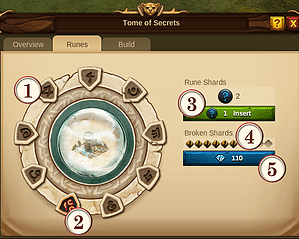 The Rune Circle can only be filled with Rune Shards specific to each wonder. Receive one random Rune Shard for any wonder which has been unlocked. Receive a random Rune Shard for any wonder, locked or unlocked, as a reward for completing some tournament provinces. 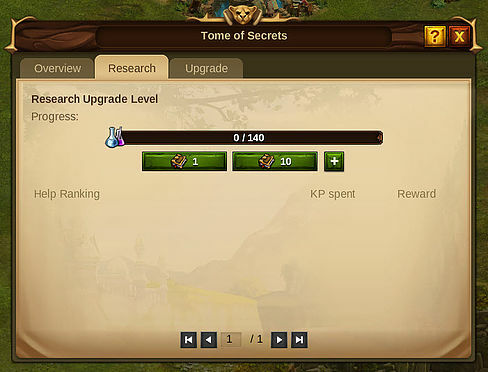 A specific or a random Rune Shards may be offered on some quests. Sometimes offer Rune Shards as rewards. Donate to another player’s wonder and be a top donor when the research is completed. Click the Runes tab in the Ancient Wonder menu to access the Rune Circle. It will match an empty Rune slot and activate a Rune. It will match a Rune already filled, break, and become a Broken Shard. When a Rune Shard is inserted, and it matches an already activated Rune, it breaks, and becomes a Broken Shard. 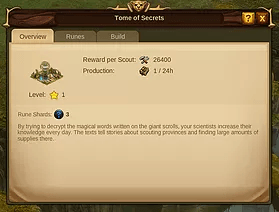 Once 10 total Broken Shards are obtained from breaking inserted Rune Shards from any wonder, they can be forged to fill a Missing Rune for the wonder of your choice. All Ancient Wonders share the same Broken Shards balance. If you forge a rune for one wonder, the balance will go back to 0 for all. You will continue to accumulate Rune Shards even for wonders which have already been built. They may seem useless at first, but don’t worry! The time will soon come where you will need them again, and you’ll be glad to have them! The Rune Circle will need to be filled again for certain upgrades. Once all 9 Runes are activated, the circle is complete, and you are ready to build the Ancient Wonder! As long as you have all of the required resources, a large enough open space, and an available builder, the Ancient Wonder can be placed. 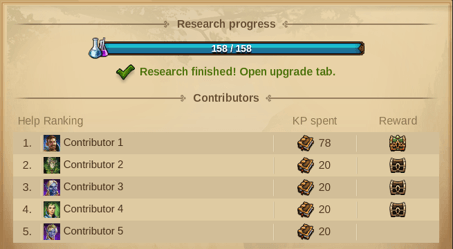 Once an Ancient Wonder has been built, the Runes tab for the wonder menu is replaced with a research tab. Insert Knowledge Points into the research to fill the bar. 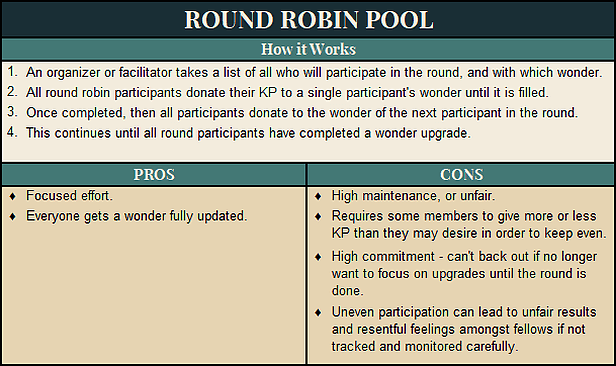 The bar can be filled with a player’s own KP, or with KP donated by neighbors or fellows. Once it is filled, the Ancient Wonder may be upgraded as long as there are sufficient resources to do so. Relics and an available builder are also required, including some of your boosted Relics. Ancient Wonders never change size or shape at any level. 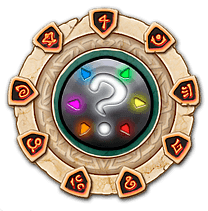 In order to upgrade the wonder from every 5th level, the Rune Circle will need to be filled again. The ‘Research’ tab will revert back to the Runes tab, where Rune Shards can be inserted to fill Runes or create Broken Shards just like before the wonder was built. To donate KP to a neighbor or fellow, simply go to their city and click on the wonder you’d like to donate to. Enter KP into the bar just like you would for your own wonder. 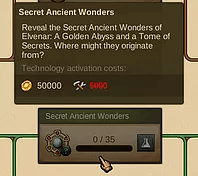 When Knowledge Points are donated to another player’s wonder, additional prizes can be won by the top donors, including Ancient Wisdom instants and Rune Shards for that specific wonder. 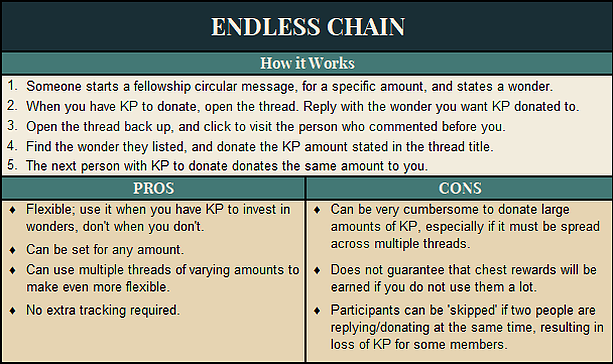 In order to take the most advantage of these extra rewards, many fellowships like to set up some variation of a swapping method to facilitate fair KP swapping among fellows. Some of the more common types used are described below. 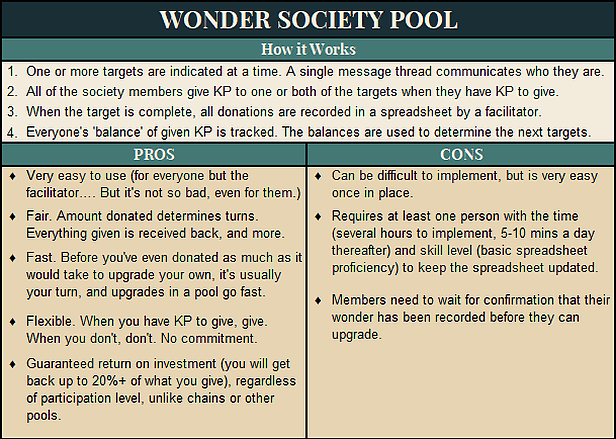 Our personal favorite is the last one, the ‘Wonder Society’ pooling method. For a more detailed and in-depth description of how the Wonder Society works and how to implement one in your fellowship, click here. For the most part, the Rune Shards you receive are random. Getting the ones you want when you want them can often feel like a luxury at best. If you’re really after a particular wonder, however, here are some ways you can try to increase your odds. 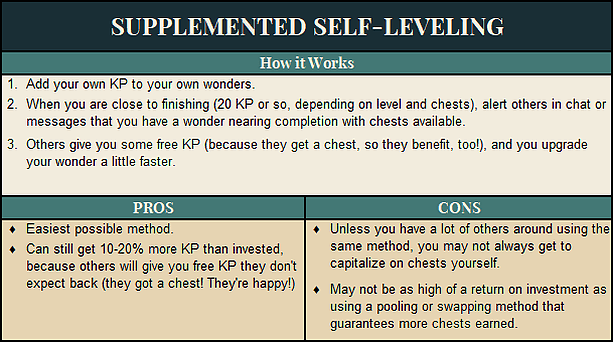 Not all players use or participate in swaps, and some may get most of their KP for their upgrades by investing it into their own wonders. You can usually donate just a few KP to a wonder belonging to such a player and still earn a top reward chest. Check out the Ancient Wonders in neighboring cities for those nearing completion. Add a few KP and you can likely luck out! KP can be donated to the wonder of any player in the world; they do not have to be a fellow or a discovered neighbor. If you are participating in any swaps, be sure to actively donate to the wonders you need a Rune Shard for when they come up. Watch your Broken Shards balance as you are inserting Rune Shards to be sure not to lose any; Broken Shards acquired above the maximum capacity of 10 are wasted. Forge the Rune as quickly as you can once you can! 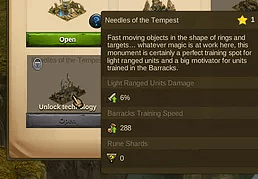 Open the target Ancient Wonder and then click to Forge the Rune. Whichever Ancient Wonder you are in when the button is clicked, this is where it will go. Avoid forging the final Rune when you still have a good amount of Rune Shards left for that wonder. Maximize Broken Shards by reserving as many opportunities to get more as you can. Keep one unfilled so you can get more Broken Shards from the remaining Rune Shards before completing the circle. Turn otherwise useless Rune Shards from wonders you don’t want into useful Broken Shards to forge runes for the ones you DO want! Insert all Rune Shards you receive, even for wonders you don’t care to build. Hope they turn into broken shards and then use them where you need to. By doing this, you can get another empty Rune Circle to insert Rune Shards into and hopefully get some more Broken Shards which can be used for wonders you DO want to build. 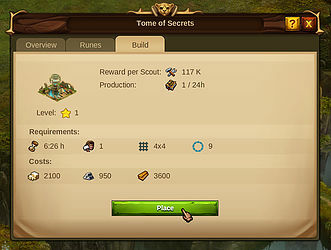 NOTE: Make sure you allow the construction to complete before selling the wonder, or the Rune Circle will not empty. Before even building their first Ancient Wonder, some players may see graphics of special buildings in the cliffs when they visit their neighbors and fellows, and often ask, what are these cliff buildings? Why are they there? How do I get one of my own? These graphics are created by certain Ancient Wonders. Some Ancient Wonders come with an added benefit of adding a special graphic to the backdrop cliff in your city; these are those wonders. Cliff buildings will not appear if the graphics settings are set to ‘low’.